Prevents and fights melanic stains. 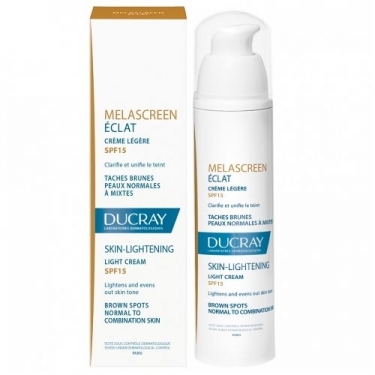 DESCRIPTION: Melascreen Éclat Crème Légére SPF15 from Ducray is a cream that clarifies and uniforms the skin. Vitamin C, also called ascorbic acid, acts within melanocytes (cells that make melanin) by blocking the enzyme involved in the excessive synthesis of melanin. Through its antioxidant activity, it also attenuates the surface coloration of melanin oxide. Niacin allows to block the melanin synthesized before the appearance of the skin. Illuminates the skin, particularly in case of irregular pigmentation. The brightness of the skin is restored. Its fluid and moisturizing texture makes it an excellent foundation for make-up. This care also contains photographic protection filters, which guarantee SPF15 protection against brown stains. Indicated for melasma, chiliasm or freckles. With green tea scent. No parabens. Non-comedogenic.